Let's first just recognize that the production crew creates a finished product. They weave together and level off the narrations that have been produced into a coherent and (mostly) seamless product. After all, even the best narrators are going to make mistakes, stumble, or need to re-read sentences if not entire paragraphs. 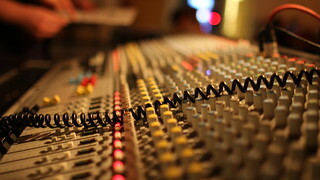 Their work in the studio can take anywhere from a day to weeks and therefore, the production crew must pull all of that together in a single experience for the listener. They must listen for consistency and accuracy of sound, making sure a narrator not only sound the same throughout the production, but also that he or she correctly pronounces words (such as foreign words) and maintain character voices. But there are other touches that the production crew adds to the experience that we're not always aware of. The introductory music or even the musical segues from one chapter to the next (or from one CD to the next--for those that still use CDs). These often set the tone and mood, providing a simple cue to the listener about what kind of journey they are about to embark upon. Some companies used this pretty consistently while others avoid it altogether. I imagine that it can be seen as an unnecessary expense or one that seems relevant for only specific markets (e.g. young adult or children's audiobooks). An extension of the musical segues is the musical score wherein music will be added in numerous ways to the production as background or even foreground (Swing! A Novel comes to mind). Though musical scores don't happen that often with regular audiobooks that have a single narrator, they do occasionally appear and they are interesting products to say the least. Of course, some audiobooks go beyond music to add a variety of sound effects. These are not necessarily dramatizations (which we'll talk about down below), but just added features. A good portion of the Star Wars audiobooks adds these such as Artoo Detoo's beeping or the snap-hiss of a lightsaber. I'm not entirely convinced they add much to the listening experience and they can sometimes be poorly integrated such as when, the text mentions the sound and pauses ever so slightly so the sound effect can be heard on its own. These can feel redundant and forced. It's better when sound effects replace text (as we'll talk about below). Though I'm not convinced on them, they still take a good deal of time and consideration by the producer. The best example that integrates sound superbly is Ross Ballard's productions at Mountain Whisper audiobooks. These sounds often make up the setting and enhance the experience without being distracting or feeling forced. Another element that the production crew must put in the extra mile is when working with a full cast for a production. Some productions will have all the narrators together, others will have them read separately and weave the pieces together. Getting everyone in the same recording studio produces it's own share of challenges as much as having each narrator do his or her own part separately. Regardless of the format, this can be a tricky process as it requires blending together numerous voices into a singular production that feels seamless. A subset of the full-cast production is the audio dramatization. I love audiobooks with a singular narrator. They are amazing to no end and will always listen to them. However, I do believe audio dramatizations are best understood as the most accurate means of adapting an audiobook into an audio format. I wrote a journal article several years ago about audiobooks as adaptation. The central argument was that taking a text and moving into an aural medium can be considered an act of translation or adaptation. If it were to be an act of translation, then you would indeed need a single narrator, reading the text straight with no inflection. But if adaptation is the goal, then dramatization is necessary. In the dramatization process, one would need to replace sound-oriented words with distinguished sounds. So to me, dramatizations are always a high-water mark for the potential of audiobooks because they maximize the medium's abilities. It's also in audio-dramatizations where the director, sound engineers, and other background are hardest at work trying to weave together numerous inputs to make the most powerful audio experience--or as Graphic Audio puts it: "A movie in your mind." I first came into audiobooks because of dramatizations. The BBC's Hitchhiker's Guide to the Galaxy sucked me into the world of audiobooks when I stumbled upon it at my local library in the mid-1990s. It helped me make sense of a book I had tried to read a dozen times. So I always try to pick up an audio dramatization at least once a month because it always feels like home to me. If you are looking for some great audio dramatizations, these are the best places to start. L. A. Theatre Works: Full-cast performances of plays both known and unknown. They often have well-known actors in lead parts and are performed in front of a live audience. They will also sometimes include interviews with the director or other great material. Many libraries carry them or grant access to them through OverDrive. Graphic Audio: They do amazing productions with full-cast, sound effects, and musical score. They focus on genre and serial fiction. They have been putting out some great audiobooks on Marvel & DC Comics narratives. The drawback is that many libraries don't care enough of their titles and they don't sell their productions on Audible, which is the go-to place for many audiofiles. BBC Radio: I would be remiss if I did not mention the BBC, given how much they changed my life in terms of audiobooks. They are still a major player in the audio dramatization field and they provide many great productions. They are a bit harder to access through the library but they do eventually end up on Audible. AudioComics: Though they are not as prolific as the ones mentioned above, they are still the potential game-changer for the field of audio dramatizations. They bring an amazing range of talent, lead by the excellent, William Dufris and focused on adapting non-mainstream comics. I have high hopes for them as a company. Again, all of these fantastic experiences are made possible by the production crew, the ever-present but often unheard workhorses of every audiobook production. That's all for now--keep an eye out for my final entry in the series that pulls all of these together.